Reaction: After this unit commits to a planet, ready it. The Tau Earth Caste is constantly testing new technology at the frontline of Tau expansion. I give this card only 3-stars due to it's "no wargear" restriction (oooh, that really hurts in Tau) and the fact that it's ability is only useful when it is moving to a planet along with your Warlord. Mind you, it's nice to not have to stay exhausted the entire first round of combat after you do commit with the warlord, but there will be many more times when you just use a standard deployment to put the Devilfish in play and it's Reaction is useless. 4 atk is quite strong, though, and means if you can do his Reaction after assigning with your warlord and you know you're going to have initiative in the battle you got a powerful 4 atk unit ready to attack. Agreed. My problem with this is the 2 health. A single token Khymera just pops this, even if you swing first this will always be getting blown up next. Maybe if it were cheaper or a flyer, but as is, I'll cut this to make room for something more reliable. It's a nice choice when you can put a unit into HQ for free, if you don't have a big 6 cost unit. Side question, I wonder what the "Transport" trait will bring with it. Nothing in the rule book hints at what it might do in the future. I think this would be worth it with a Landraider or a FireWarrior Elite as those units don't really need to be ready to be effective. Meanwhile the Devilfish could just jump along with the warlord and cause havoc while the other units cover for them. You'd still have problems from direct damage though, and 2 health isn't a lot to defend with. This unit's ability is very good. However, its inability to take Wargear attachments (or Shadowsun's Stealth Cadre) limits it significantly when coupled with its low health. On the other hand, if you can use initiative or shields to ensure this gets a chance to attack, it can be quite effective. I would love this unit as a 3/3, but as a 4/2 I think it's a little too vulnerable to make it into most of my decks. Great card, but does not mesh with what Tau is trying to do right now. 3/5 until vehicle upgrades become a thing. 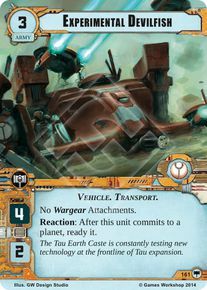 Good card with fantastic potential once Tau will be able to put Vechicle attachments on this that will make his behind better. Currently a 3/5 but can grow for sure. This will be a great card with Aun'shi and the Ethereals. Commit with the Warlord, ready and hit for 4 Armorbane. Very nice. At the moment it's low health is a problem. Health is an issue, but I'd actually say the main problem is it can't use any of the current attachments, so Shadowsun's archetype doesn't pair well with them. No attachments and low HP make this card non synergic with tha faction. Such a shame. I know this is an old post for most, but I have only recently begun playing (about two months now). That being said, I was curious as to this cards effectiveness in a Ragnar deck? It seems to me, and I could be wrong; that Rags, with one of these jumping with him, becomes a bit more dangerous to the enemy warlord. Admittedly, there are answers to it: routing, direct damage, etc. However, that causes the opponent to focus on it rather than Rags, or another unit that may be a bigger threat if it was untapped. Add on to the fact that if you do kill it I may have a vengeance, bringing that bigger threat into play. So any thoughts on it? Anything I maybe missing? Whilst your reasoning holds, this only has 2hp which means that it won't redirect much attack towards itself in reality. I have found, however, that this card works decently well in a vehicle heavy Starblaze deck since you can Dozer Blade up its low hp, although that might fall apart once Gorzod's released. Furthermore, Space Marines already have excellent units in the 3-cost department, and since their most powerful effects require of SM units, you're often better sticking to them than trying to get something out of alliances. I agree that SMs have great units for 3 cost, and obviously I'd lose some synergy when it came to events... however, vengeance still readies a SM unit no matter what unit leaves play from my control. I understand that I am using up a card slot, and relying on having a very specific card in hand, but having an untapped 4 attack still shields a SM unit that may not have survived otherwise. I feel like these guys would be a good replacement for white scars, (who for the same cost have +1HP) but after returning to the HQ come in with my warlord exhausted and are not a threat until after my opponent has already exhausted his side of the board. Obviously, this works better when I have initiative, later in the game with units already in play. Or when both my opponent and I are coming to a planet with units exhausted from HQ. I guess it's entirely dependent upon the deck build, as I am trying to find a new way of playing SM without using the same old DPA, DPA, DPA, Maxos, ambush, ambush, ambush. I know it's the tried and true method of SM play, I just feel like there's more fun to be had playing in new ways, and looking at different cards in new ways. Trying to surprise my opponents, who when I sit down at the table with Rags, say: "oh great, ambush and DPA... well, now I how to play against that deck." Anyway, I have rambled enough. Thanks for the feedback! I absolutely agree that you can push new and different deckshapes and come up with something just as effective. I'm a big fan of Ragnar Rally-The-Charge decks that don't use DPA at all, and concentrate almost wholly on 5 and 1 cost units. Experimental Devilfish probably lends itself best to a "snowball" approach, and that in turn could synergise well with Starblaze. However, snowball decks aren't quite there yet, given they have certain obvious weaknesses (warpstorm, doom, etc.) and because they have to make sacrifices to command phase strength to achieve that rolling effect. Worst of all, they tend to be somewhat predictable in warlord commitment, and predictability is a big no-no in top level play. Keep experimenting though! Innovation doesn't come from repeating old archetypes. One notable weakness of this card, in the current meta, is that 2 HP is pretty fragile. A cheeky ranged strike from many warlords, a rotten plaguebearers / zarathur's flamers / gleeful plaguebeast out of zarathur, an opponent's Ragnar trigger... there's a lot of ways to generate 2 damage. Shields help, of course, but in practice its a LOT easier to keep a 3HP unit alive than a 2HP unit. I played a bit with these a bit last night and found that they were far more effective against certain warlords than others, and almost useless without initiative or against ranged. I was contemplating adding in fenrisian wolves to help with this, but I feel that 5 resources(3 devilish +2 Wolves) for a throw away 4 damage may not be worth it. Especially considering I really want a to build a warlord hunting deck, and the wolves can only target army units. While the devilfish may take out some ranged opposition allowing me to get Rags out of a bad situation (the two I encountered were against au'nshi and Broderick, both with armorbane). I may need to playtest a bit see if it's worth it. Doesn´t see much play, but it has good stats and ability for its cost. Maybe one for the future of vehicles in Tau gets more love.